Early childhood music class with Melissa Sigh from Sigh Studio of Music! Zumba® with Antonio Cruz from Cruz Control Fitness! Check out the following attractions going all day! Rock and Rest – Meet with local breastfeeding support groups at a nursing and diaper changing station! Meet staff from Little Green Branches at 11am and 1pm to learn about cloth diapers! Ma Spa – Get some tips for quick and easy make up for the busy mom from Simply Bliss Spa and Esthetique and Makeup by Alina ! Relax with a quick massage from Meridian Massage and Bodywork and Molly Massage! Shop for cute things for you (and donate to Willow Tree!) with LuLaRoe Mint Sky ! Kids Korner – Join the Capital Area District Libraries (CADL) for crafts, a sensory table, story time, and a special visit from Lexi! 10:15, 11:15, and 12:15 Storytime!!! Mid Michigan Babywearers – Meet with leaders from Mid-Michigan Babywearers to learn about safe babywearing, and how to keep your baby close enough to kiss! Babywearing 101 class is running at 10:30, 11:30, 12:30, and 1:30! Stop by to learn about different kinds of carriers and which may be right for you. Healthy Habits – Learn about how to have a healthy pregnancy and strong start for your babe! Join students and faculty from Lansing Community College’s Dental Hygiene Program for Oral Cancer and Exam screenings and information. Learn about tobacco cessation with the Michigan Tobacco Quitline. Meet staff from multiple programs with the Ingham County Health Department. Lansing Doula Network – Meet some of our local doulas and learn all about many different pregnancy and birth-related topics! Whether you are pregnant or planning on getting pregnant soon, come and learn about what you can expect and how to promote a healthy pregnancy. Topics include common discomforts and remedies, how to get the nutrition you and your baby need, and what types of exercises can be done during pregnancy. Are you pregnant? Thinking of becoming pregnant?Did you know that utilizing a doula during labor is proven to lower the use of unnecessary interventions and improve your satisfaction with your labor experience? Join us to learn more about what a doula is and how a doula could help you meet your birth goals. Have Questions About Breastfeeding? Breastfeeding 101 will explain basic concepts of milk making, early feeding cues, and how to recognize a good latch. With tips on identifying when to seek help and managing the first weeks at home. Have you always wondered about what a home birth looked like? Is it all about candles and being on your couch? What about the mess? Come to this mini-session to get the answers to these questions and more. Tour a birth tub, see a midwive’s set up and a really adorable special guest. Stop by the following exhibitors, who are generously donating a portion of their proceeds to Willow Tree Family Center as a donation! 11:00AM & 12:00PM – Ingham Great Start presents Parent Cafè! What are the benefits of being friends with those in your child’s playgroup? What do you want to teach your children about friendship? What gets in the way of asking for the help you need? How do you stay strong and flexible? Join Ingham Great Start Connect for one or both Parenting Cafè sessions. There is limited seating for 12 parents per session. Engaging activities for kids are provided by Capital Area District Libraries while you engage in conversation about the above questions, and more! 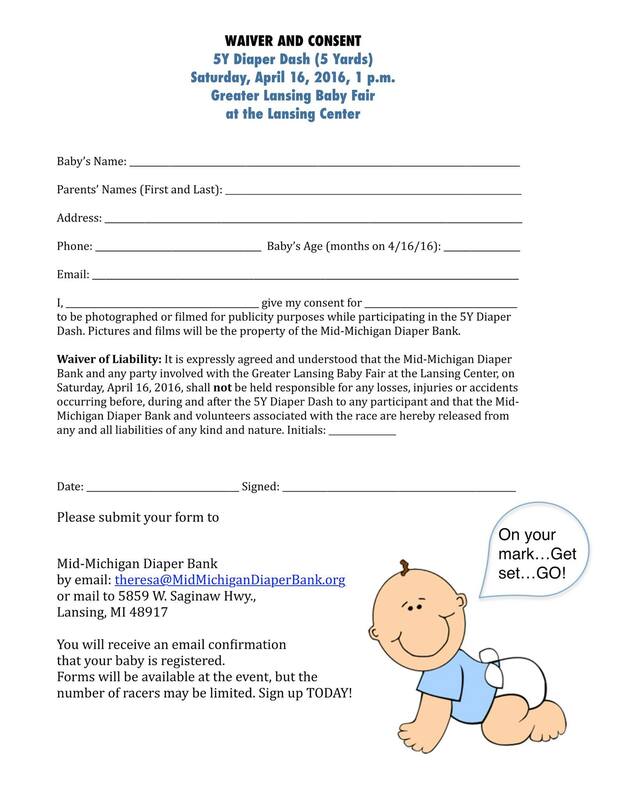 1:00PM – Mid Michigan Diaper Bank presents the 5Y DIAPER DASH! A coach is on both ends, as a starter and also a coaxer to the finish line! 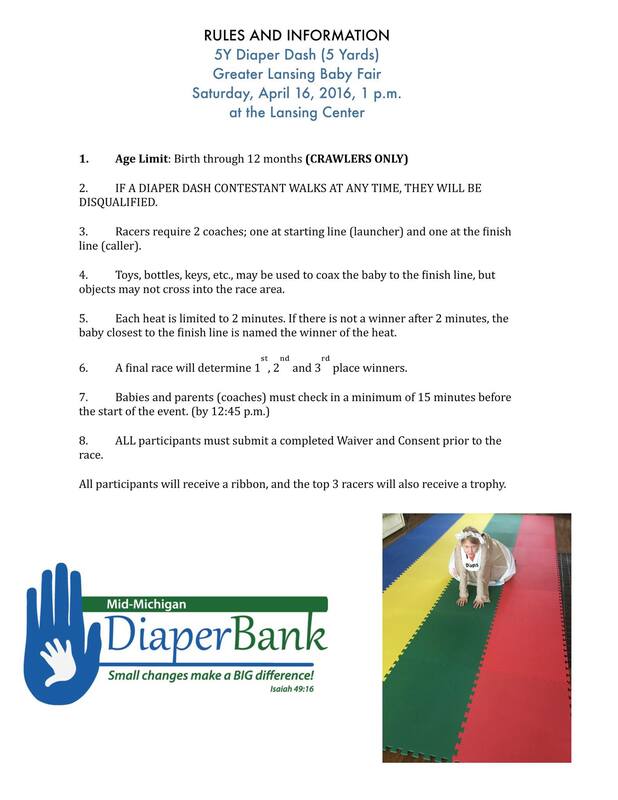 Coaches may use any means necessary to coax their babe but cannot enter the race area. All participants receive a ribbon, and fastest three dashers will get a trophy!